London - Arsenal celebrated Arsene Wenger's 800th Premier League game as manager with a win but only after coming from a goal behind to beat Swansea City 2-1 at the Emirates Stadium on Saturday. The Swans went ahead in the 22nd minute when Sam Clucas scored his first goal for the Welsh club since a pre-season transfer from Hull City. But Sead Kolasinac equalised six minutes after half-time and Aaron Ramsey put Arsenal ahead seven minutes after that as the Gunners recorded their 10th successive home win in the Premier League. 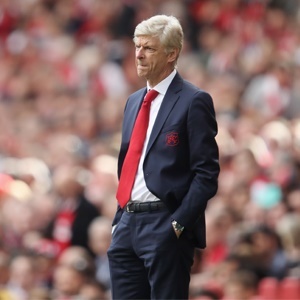 There were few signs early in the game of the struggle in store for Wenger's men and such was Arsenal's command in the first 20 minutes they felt free to pass the ball with all the intensity of a five-a-side training match. Their lack of urgency, however, meant that Arsenal's only significant efforts on goal in that period came when Per Mertesacker headed an Alexis Sanchez free-kick straight at former Gunners 'keeper Lukasz Fabianski and Hector Bellerin's shot was blocked by Federico Fernandez. Perhaps the feeling that it was all too easy was responsible for the error by Laurent Koscielny that led to Swansea taking the lead. As he stepped forward to clear a long diagonal ball from Mike van Der Hoorn, the Frenchman stumbled and then fell, leaving Swansea's on-loan Chelsea forward Tammy Abraham in possession and in space. Abraham instantly turned and slipped the ball between Bellerin and Mertesacker for Clucas to run onto and roll his shot under Arsenal goalkeeper Petr Cech. The shock should have roused Arsenal, but they were still lethargic. Mesut Ozil was unable to reach a pass over the defence by Sanchez and Clucas might have had a second goal as a gap suddenly opened up in front of him before he shot just wide of Cech's right-hand post. Fabianski did not have to make a serious save until the 40th minute, when Sanchez exchanged passes with Nacho Monreal and fired a fierce shot towards the far top corner. Fabianski, though, flung out his right arm to push the ball over the crossbar. Swansea had yet another chance to double their lead when Mertesacker was caught in possession by Jordan Ayew, who advanced and saw his shot saved by Cech at the expense of a corner. Whatever veteran French boss Wenger said at half-time seemed to inspire his players and a more aggressive Arsenal were level six minutes after the break. Alexandre Lacazette forced his way into the Swansea penalty area and both he and Ozil had shots blocked. The ball ran loose to Kolasinac and although Fabianski got a hand to his shot he could not keep it out. If Arsenal expected Swansea to collapse, they were disappointed. They had the ball in the net barely a minute later only for Abraham's close-range finish to be ruled out for offside. But in the 58th minute Arsenal were ahead. This time Kolasinac was the creator, chesting the ball down and finding Ramsey in an unusual amount of space in the Swansea defence. The Welshman's first-time left-foot shot was not powerfully struck, but too well-placed for Fabianski to save. Suddenly full of running, Arsenal made chances to extend their lead. Lacazette was inches from connecting with Bellerin's cross from the right, and Bellerin's shot at full stretch from Ramsey's pass sent the ball looping over Fabianski but against the bar.